THIS PARTY IS NOW SOLD OUT!!! 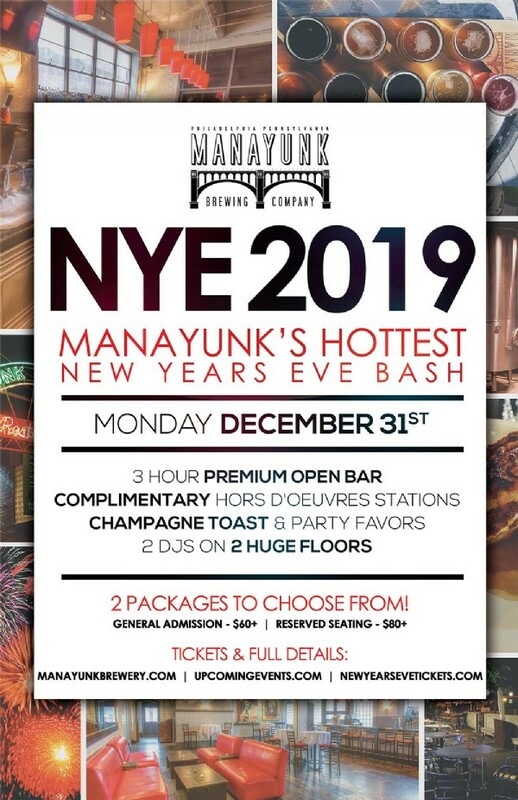 WE ARE DIRECTING EVERYONE TO OUR OTHER PARTIES IN MANAYUNK AT LA ROCA & BOURBON BLUE (CLICK HERE FOR DETAILS) AND ALL OUR OTHER 20+ PARTIES IN THE PHILLY/MANAYUNK AREA HERE: https://www.NewYearsEveTickets.com/philadelphia NO MORE TICKETS WILL BE RELEASED FOR THIS PARTY. See you & your friends there! Be sure to "Like" & "Share" above to help spread the word!! New Years Eve 2019 at the Manayunk Brewery - this is it. It's what you all have been waiting for! Craft beer, multiple rooms & DJs, dancing all night long, great food, shaken drinks, and 1,000 new friends to ring in 2019 with. Yup, it's NYE 2019 at the Manayunk Brewery! This year back by popular demand #hatchfest will be joining us and providing live music! NOTE: doors open at 8pm, with a cash bar until 9pm - get there early to beat the rush! Tables will be on the 1st floor only. Email & Facebook (click "like" and "share" above) your friends, family, and co-workers. Grab your tickets - you are in for a night to remember! Dress to Impress in your NYE Festive Attire. 21+ Event – Must Show Valid ID!